A swerve into untrodden ground should give a surprise boost to the box office, when a studio makes a pitch to a demographic that they haven't catered to in a long, long time – that's right, I'm referring to romantic comedy fans. 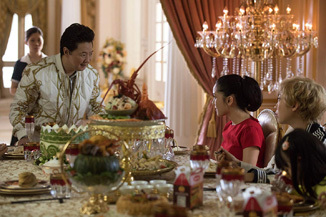 OK, OK so Crazy Rich Asians is notable in that it's the first entirely Asian cast of a Hollywood movie since 1992's Joy Luck Club (I feel we shouldn't sleep on 2002's Better Luck Tomorrow even though it was an independent film, especially since it launched the career of one Justin Lin). That's certainly something unique in the marketplace and seems destined to energize that demographic like Black and Hispanic-cast films have done for those in the past couple of decades. But what's set to really make this film stand out in the marketplace is that it's a romantic comedy in a world where those films, at least the big budget, glamorous version of those, has basically gone extinct. Based on a phenomenon of a novel, it stars Fresh Off the Boat's Constance Wu as an NYU professor who falls into a romance with a Singaporean man, Nick Young (played by Malaysian travel host Henry Golding in his first movie role). When he offers to take her back home to a friend's wedding and to meet his family, she discovers that he's actually the scion of the wealthiest family in the country, and the eventual heir to a fortune. Will her uncultured western ways clash with the refined high society of Singapore? Will sassy best friend Awkafina say some crazy stuff and make us laugh? Can she win over her dragon lady future mother-in-law (Michelle Yeoh)? Have you ever watched a movie before? Part travelogue, part wish fulfillment fantasy, it's got the right blend of glitz and cheese to make the Asian casting almost irrelevant, although it's still an important driving factor. The ecstatic reviews don't hurt either. Opening on Wednesday to $5 million, it should carry strongly through the weekend for a first weekend take of $28 million. Peter Berg's fourth collaboration with Mark Wahlberg hits screens this weekend with Mile 22, the story of a top secret commando unit, used as a team of last resort, tasked with smuggling a police officer out of hostile foreign territory in SE Asia to a landing strip 22 miles away (oh I see now) with ambushes all the way. Wahlberg plays The Man With All The Answers, while Rounda Rousey and Lauren Cohen make up the most recognizable members of his on-the-ground support team. It's fairly humorless, straight ahead gritty action, with the machismo style that Peter Berg has been refining over the past decade or so. It's also pretty ugly looking in many ways, both from a plain visual aspect and from its politics, which lean hard to the “evil anonymous foreigner” side of things. Reviews are basically non-existent, which tells you most of what you need to know about its quality.